A dizzying chase scene in a forest leads to a group of apes being captured and taken to a high-tech science lab. The apes are experimented on with a drug called 112, which is believed to make them smarter. It's set to be used as a cure for Alzheimer's on humans, too. This interests young scientist Will (James Franco) because his father Charles (John Lithgow) is deteriorating from the disease. When an ape breaks out in defence of its baby the entire program is meant to be shutdown and the advanced creatures destroyed. 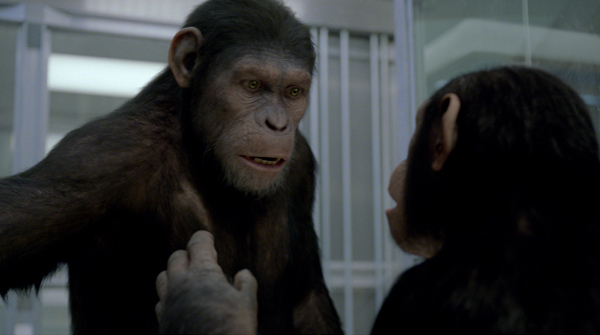 Unable to kill a young ape called Caesar (Andy Serkis in motion capture), Will takes the advanced creature home as his pet and it grows up with him, becoming increasingly more sophisticated with each year. 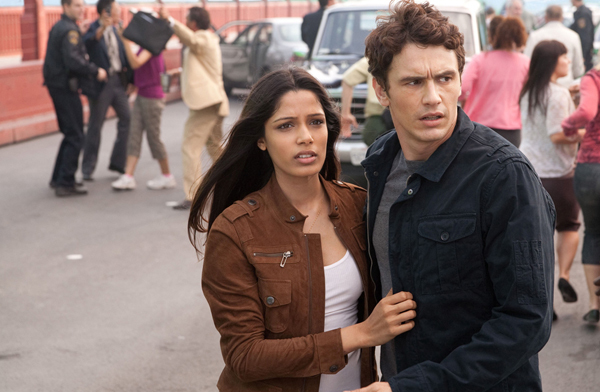 It is in this period that Will starts a relationship with a vet named Caroline (Freida Pinto). Will also uses the 112 drug that he stole as a temporary cure for his father. But after a public incident Caesar is taken away and thrown back into a cage, where he is taunted by Dodge (Tom Felton). Cutting edge visuals prove at odds with an undercooked script in the second failed reboot of The Planet of the Apes franchise. It's been over forty years since the original film, which spawned four sequels and an unfavourable Tim Burton remake in 2001. This time the apes are mostly CGI and motion captured, instead of actors in costumes and makeup. They don't have the anthropomorphic qualities anymore. They're regular looking apes, who for the most part don't speak. The faces of the creatures and the animations, courtesy of Andy Serkis and Weta Digital, are spectacularly detailed and about as expressive as the scowl of an ape can be. It's an appeal to a more grounded approach that Hollywood reboots are now hungry for, given the success of the Nolan Batman films and Casino Royale. But grounding the film like this also means losing some of the fun and the rich irony of the Charlton Heston picture. Hearing the apes speak and interact in their own structured hierarchies, against a sinking Statue of Liberty, revealed that the apes were not from a primitive alien world but of a scary perpetual present on Earth. Starting the franchise over as a formulaic white coat thriller reduces the film to asking the same moral questions about genetic engineering that science fiction authors like Huxley have posed for decades. And stretching the story over several years too does little to justify the bewildering motives of Will's employers either, like why they would persist with the experiments again after their first major disaster. The film is also more turkey than super ape because there's a lack of interesting human characters. James Franco's talents are usually dependable, but even he is limited by a flatly characterised and underwritten part that does little to spark his charisma. His relationship with the underused Freida Pinto (Slumdog Millionaire) adds nothing to the story and the subplot with his father is unmoving. John Lithgow looks extremely out of place because some of his expressions - particularly in a scene where he's trying to start a car - appear too comical. But the most disappointing aspect of the narrative is the trajectory. Far too much time is spent inside the labs and between cages with stock characters like Tom Felton's Dodge, who is still in Malfoy-mode. The development of Caesar is indeed visible as you can see some strands of intelligence growing, like when he expresses that strength is found in unity and numbers. 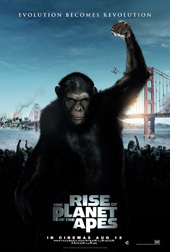 But the title of this film is criminally misleading and a cheat because the gap between the intellectual development of the apes and overthrow of the Earth is never bridged. The uprising, right at the end of the film no less, is one long dopey action sequence that's more like a standoff with the SWAT cavalry than a global revolution. And it's here that the credibility of this increasingly silly film plummets. The apes suddenly become military tacticians and before you can say 'overblown' Caesar rides in from the smoke clouds like General Custer on horseback. If Hollywood considers rebooting the Apes franchise again after this misfire, I'm hoping they'll consider the Troy McClure musical Dr. Zaius instead. No banana.